It’s a year of musical tourism in America in 2018, and organizers of the IPW travel trade conference last week ensured that delegates went home with that theme firmly embedded in mind. 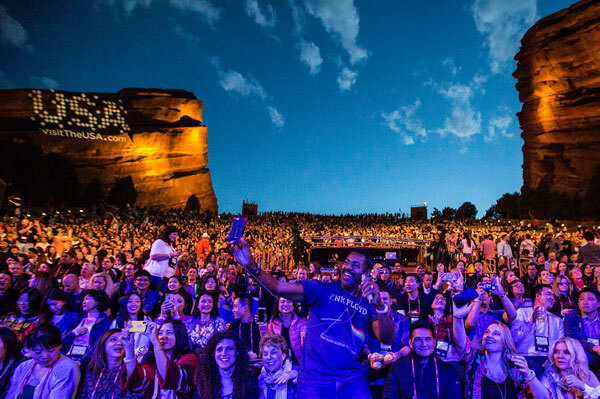 They did so by presenting a schedule of impressive music concerts during this year’s IPW, held in Denver at the vast Colorado Convention Center, plus venues in and around the city. Most of these took place at the daily lunches, including shows by early new wavers the B52s, Rob Thomas of Matchbox 20 and a medley of show tunes by cast members of Broadway musicals. 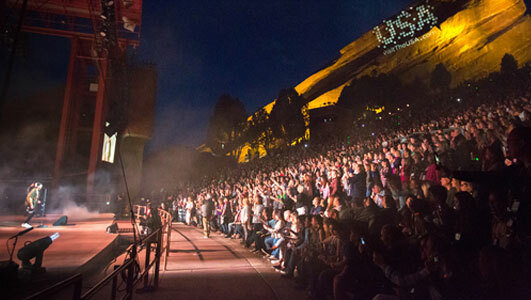 But the finale, featuring a concert by Colorado-formed rockers OneRepublic, was held at the iconic Red Rocks concert amphitheatre and was clearly a hit with delegates. Most left for home the next day with reminders that American pop and rock music can be a powerful art form that serves well as a tourism motivator. Destination marketing organization Brand USA has unveiled “Hear the Music, Experience the USA,” an integrated marketing campaign that uses the power of music to promote international travel to the United States. To amplify the campaign, the organization has partnered with digital music service Spotify to enhance discovery and exploration options with more than 20 customized US city soundscape playlists. The musical storytelling tool presents a new way to inspire, invite, and welcome visitors from all over the world. Also, the focus on sound in the campaign aligns with Brand USA’s new large format film, “America’s Musical Journey,” which explores America’s history through its distinctive music and sound. “Music is a universal language that transcends language and cultural boundaries, and Hear the Music, Experience the USA presents an entertaining and highly engaging platform to showcase vibrant destinations across the United States,” said Tom Garzilli, chief marketing officer for Brand USA. Delegates representing U.S. travel organizations from across the United States and international/domestic tourism product buyers – plus media from 70 countries – numbered over 6,000 at IPW in Denver. They descended on the city to network and meet face-to-face for three days of pre-scheduled business appointments, with the goal of generating future travel business to the U.S.